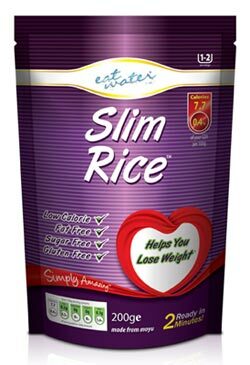 I was recently sent some Slim Rice to try—it’s made by a company called Eat Water. They sent me the ‘rice’ to try—obviously real rice is naturally gluten free (so don’t get confused) but since, I imagine, each of the products are fundamentally the same, simply presented in different shapes, it didn’t really matter which one I tried. And they are all gluten free. All the Eat Water products—rice, pasta and noodles—are listed in the Coeliac UK Food And Drink 2013 directory (under Pasta and Noodles) as being acceptable for a gluten free diet. I’ve been struggling to know what to say about this product, because there isn’t much to say, as it tastes of very little. But it is innocuous enough, and with a flavoursome sauce, is fine. And it is, as promised, filling. It is, apparently, based on moyu (konjac), a vegetable fibre which has been used in Asian cuisines for centuries, and I can imagine that a good use for these products would be in a noodle soup or similar dish – think ‘rice noodles’ as a comparison. A few recipes are available on the Eat Water site to get you started. If you’re looking for flavour, I’d have to say that eating true rice or a decent pasta would offer more, but if you want to cut down on calories, you could consider trying this occasionally instead of your usual carbohydrate to fill you up. It isn’t cheap, but as a kick-starter for a weight-loss diet, it might be just what you need. My main concern when I first heard about this low-calorie, gluten free product was the potential for conflation with the ‘go gluten free to lose weight’ school of thought. As you may know, I have mixed feelings about this view, because while it widens the market, making it more desirable for food manufacturers to provide gluten free food, it can trivialise the importance of going gluten free because you have coeliac disease. Those who choose to be gluten free to lose weight and then aren’t consistent in their diet (“a little bit won’t matter”) make it less likely that those who must be gluten free, and for whom even a little bit matters a lot, are taken seriously. However, having reviewed the Eat Water site, I don’t believe that they are falling into this trap. Their products are primarily aimed at those who want to consume fewer calories, and it is an almost-accidental bonus that the products are also gluten free. 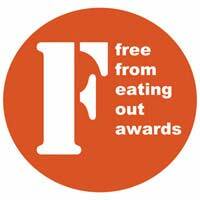 Incidentally, two of the products have been shortlisted in the recent FreeFrom Foods Awards – do go and check out the shortlist. If you have to be gluten free and also want to reduce the number of calories you eat, this could be an option to consider, as long as you continue to eat a healthy and well-balanced diet overall. And you’d want to do that on any weight-loss diet, wouldn’t you? Gluten free and need to lose weight?